Ice is usually the first port of call for an injury. Most of us are familiar with the acronym PRICE – protect, rest, ICE, compress and elevate. This is a good reminder that ice is best used in the acute/fresh phase – up to 48 hours post injury. Soft tissue injuries such as sprains (rolling an ankle or twisting a knee for example) or strains (pulling a muscle) result in the body initiating the inflammatory response. This response involves an influx of fluid to the area, full of cells specifically designed to heal damaged tissue. This response, although a natural healing process by the body, leads to excess swelling, bruising and pain. Ice can be utilized to reduce this. The cold temperature acts as a vasoconstrictor, narrowing the blood vessels delivering blood to the damaged tissue, restricting the influx of fluid, which in turn, reduces the resultant swelling and bruising. It also reduces pain by slowing the pain signals being sent to the brain and numbing the area. It must be noted that the use of ice has recently been debated and some research suggests it delays healing (for more information click here and here). Despite the arguments being made, ice is still widely used in the medical field and sporting industries as a cost effective, temporary pain reliever when used correctly, at the right time. Once the area feels numb, usually around 8-10 mins, remove the ice and allow the injured area to warm up naturally, 1 to 2 hours is usually sufficient. Then repeat the process a few times throughout the day, up to 48 hours post injury. Anyone suffering from Raynauds Phenomenon, sensory loss to the area or cold hypersensitivity should avoid using ice. Always consult your Dr if you are unsure though. Its also not beneficial to use ice on old, chronic injuries and stiff muscles. And definitely don’t use ice (or heat for that matter) on an open wound – it can greatly increase the risk of infection and we don’t want to slow down the natural healing process in these situations. While ice is used to reduce pain and inflammation caused by acute injuries, heat is used in more chronic situations. It can relax muscle tissue, decrease hypertonicity (fancy word for tension) and reduce the achy, dull pain often created by stiffness in joints and muscles. It does this by acting as a vasodilator – widening the blood vessels of the tissue and improving circulation to the area. With improved circulation more oxygen and nutrients are carried to the injured area, promoting healing. It also has a neurological effect – calming the nervous system and in turn, decreasing pain. As it decreases muscle tension it can be particularly useful to apply heat prior to stretching or even before activity. Heat applications can come in various forms, perhaps with the most common being a hot water bottle or a microwavable bean bag. In my treatments I use an electric, moist heat pad, all of which are readily available at the local pharmacy or online. Whichever product you use be sure to follow the instructions to ensure safe use! Always be careful with heat and keep checking the skin for what’s called ‘blanching’. This is the blotchy red and white pattern that can appear on the skin after prolonged heat – ideally the heat should be removed before this occurs! Usually around 15 mins at a comfortably warm temperature should be sufficient. Due to the catalytic effect of heat, it is important NOT to use it when inflammation is present as it will speed up the metabolic activity of the cells and increase the swelling and bruising. So never use heat for acute injuries! 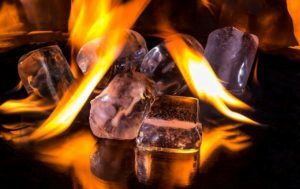 Similar to ice, heat should also be avoided if there is any sensory impairment or an open wound. Also consult your Dr if you suffer from hypertension or cardiac conditions as heat can alter circulation which may not be beneficial with these conditions. Ice is for inflammation – acute injuries or pain. Heat is for achy, stiff muscles with no signs of inflammation. Of course if you are ever unsure of which modality to use please consult your Dr or feel free to reach out to me directly with any questions. ← Tension headaches – a pain in the neck!